I grew up with horses and have wanted to learn as much as I can about them since I was little. I was in 4H for seven years and showed regularly in Hunter Jumper, English equitation, Western Pleasure, Horsemanship, Ranch Riding, Trail, as well as Halter and Showmanship. 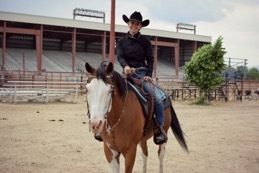 My horse Dakota and I were also on the drill team where we did flag ceremonies for county fairs and shows. I started two of my horses, one who I had raised as an orphan, and worked for an Andalusian breeding farm where I started all the young horses with ground work and being saddled. 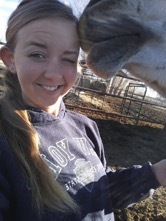 I went to CSU where I majored in Equine Science and Minored in Zoology and also became certified as a Therapeutic Riding Instructor and Equine Mental Health Specialist. While in school I worked for the Equine Reproduction lab, where I got a lot of experience with breeding and barn management with a large number of horses. After school I moved to Hawaii for a few years where I got to work with PATH International Master instructor Sandy Webster and finish my instructor certification, as well as lead ocean front trail rides, exercise polo horses, and get into a little bit of Dressage. Even though I’ve worked with different trainers off and on, and there is always more to learn, my biggest lessons have always come from the horses themselves (and simply by trial and error!). Every horse is a unique individual with something to teach us about ourselves- they enable us to self reflect by having clear communication, boundaries, and confidence. They can see through anything we are pretending to portray and sometimes it’s before we even realize it! Horsemanship should be about establishing a connection with the horse and building a willing and trusting partner. I’ve often seen this as a disconnect within the competitive world and want to bridge those worlds together with the next generation of horseman.